So you are a new yearbook adviser, or you have been advising yearbook for a year or two, and you still aren’t really sure what you have gotten yourself into. Don’t panic! I’ll walk you through what your first steps should be to make sure that your first (or fourth) year is a huge success, and you don’t lose your mind in the process. First of all, in Yearbook, we use the more proper term “adviser,” and not “advisor.” There is a long explanation for this, but just remember when you bemoaning bragging about your new title, you want to be as technically accurate as possible. Secondly, there are many paths to becoming a yearbook adviser. Perhaps you were were a yearbook staff member when you were in high school. Perhaps you took on the position as a newbie teacher looking for a job. Perhaps you were asked to step in after a colleague vacated the position. Perhaps you were really looking forward to a new challenge. Either way, here you are, and you might bee feeling like Yearbook has a steep learning curve for you as a teacher. There are many reasons that teachers do not fight over the position of yearbook adviser. Let’s be honest, there is quite a bit of extra work, and the responsibility falls squarely on your shoulders if something should go wrong. It’s a daunting task, and that is why many of your colleagues will eschew the position, if given the opportunity. But here is why you should not listen to the naysayers in your department: being a yearbook adviser has been one of the most rewarding experiences of my life. While it does require some extra work, I have found that being highly organized, delegating tasks to yearbook staff members, and focusing on the positives, I really do enjoy my time as an adviser. Being able to get involved with everything that happens — both on and off campus. Watching my staff develop new skills and become leaders. Getting to know all students. Getting to know all faculty and staff. Seeing all my hard work come to fruition at the end of the year. Seeing the student body and staff look at our hard work at the end of the year. It appeals to my love of organization and editing. It also appeals to my creative side. Next up: How to structure your staff for best use of their skills and easiest management on your part. I advise a 400-page chronological yearbook, and we publish on a year-round basis. Training new staff members at the beginning of the year is important, and it must be done as quickly as possible. This is the first activity I have my new staff members do as an introduction to the parts of a yearbook and some of the terms that we used in publishing. This worksheet is to be used in conjunction with sample yearbooks. I keep 20-30 different yearbooks in my classroom at any time as they serve as good inspirational and educational resources. Each student takes a sheet and a yearbook. The form is rather self-explanatory and directs them to look for certain elements in the book. Upon completion, students are asked to rate the book and then present their findings in from of the class. 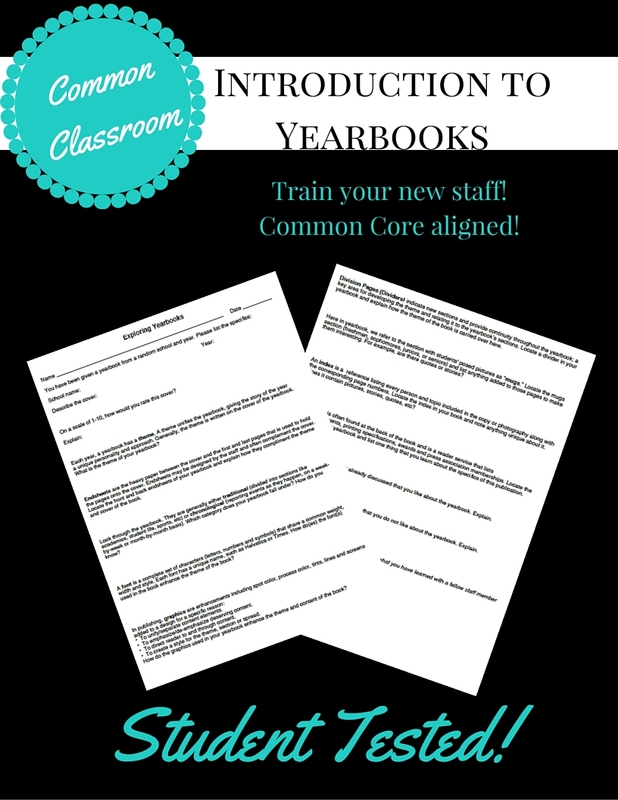 Most students are familiar with what a yearbook looks like and what he or she can expect to find inside on. This worksheet focuses on important terms and vocabulary that students will need to know for the rest of year.